CMA Practice Tests are an ideal way to prepare for your upcoming American Association of Medical Assistants certification (AAMA). The CMA medical assistant exam is intended to certify that a candidate has the knowledge, skills, and abilities to perform the duties of a Medial Assistant. The CMA exam consists of 180 questions on various Medical Assistant job functions (e.g., general, administrative, and clinical). 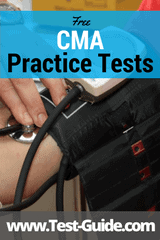 Our free CMA practice tests are listed below. The best way to study for your Medical Assistant Certification exam is by taking sample questions. Our free CMA sample tests provide you with an opportunity to assess how well you are prepared for the actual test, and then concentrate on the areas you need work on. Test-Guide.com's CMA sample questions are an excellent way to study for your upcoming certification exam. Our sample tests require no registration (or payment!). The questions are categorized based on the CMA test outline (see below) and are immediately scored at the end of the quiz. Once you are finished with the quiz, you will be presented with a score report which includes a complete rationale (explanation) for every question you got wrong. We will be adding more sample test questions in the near future, so please come back often. If you like these CMA practice questions please make sure to like us on Facebook! Understanding the Test Format - Every standardized test has its own unique format. As you take practice CMA tests you will become comfortable with the format of the actual test. Once the test day arrives you will have no surprises! Improving Your Speed - The CMA exam is broken down into 4 40 minute segments. Although most students who take the CMA feel that there is sufficient time, taking the practice tests with self-imposed timers help you budget your time effectively. You should budget approximately 1 minute for each question. The CMA/AAMA certification exam consists of 180 questions that count towards your score and 20 unscored pretest questions. All of the questions will be multiple choice questions with four answer options. Category 1 : You are a current student or recent graduate of a CAAHEP or ABHES accredited Medical Assistant program. Current students can take the exam no more than 30 days prior to graduation. Graduates must take the exam within 12 months of graduation. Category 2: You have graduated more than 12 months ago from a CAAHEP or ABHES accredited program. Category 3: You have previously passed the CMA certification exam and are applying for recertification. Note: The CMA credential must be recertified every 60 months by either continuing education or taking the exam again. Candidates for the CMA exam will be assigned a 90-day period in which to take the exam. If you apply from the 1st to the 14th of the month, your 90-day period will start on the 1st of the next month. If you apply from the 15th to the end of the month, your 90-day test period will begin on the 15th of the next month. After you apply you will be given a test center Scheduling Permit. Once you receive your Scheduling Permit, you can schedule your exam by going to www.prometric.com/aama or calling the number listed on the permit. The Prometric test appointments are available on a first-come, first-served basis - so the earlier you schedule your test, the better chance you have of getting your desired time and/or test location. If you do not take your test within the 90-day test period, you forfeit your entire exam registration fee. Candidates may request to transfer the 90-day test period to the next immediately available test period for a $65 fee. $125 (for Category 1 candidates or Category 2/3 candidates who are AAMA members). $250 (for Category 2/3 candidates who are not AAMA members). The CMA/AAMA exam is scored on a pass/fail basis. The passing score for the exam is based on a variety of factors including established difficulty ratings for each test question. If a candidate passes the exam they have demonstrated an acceptable level of knowledge regarding the skills and abilities required of a Medical Assistant. Receiving a higher score than the passing score is not an indicator of more advanced knowledge or a predictor of better job performance. You will receive a notification of pass/fail immediately after finishing the exam. This notification is not an official verification of CMA certification. Your official score report will arrive within four weeks of your test date. This score report will include your rank (percentile) in the three major categories (General, Administrative, and Clinical) which will help you identify your strengths and weaknesses if you need to retest.